Packed with Elsie and Emma’s happy spirit and unique style, A Beautiful Mess Photo Idea Book will inspire you to capture your days, your friends, and your dreams in beautiful photos! Initially the connection between this photo idea book and the blog A Beautiful Mess didn’t cross my mind when I borrowed this book. Only at home when I took another look at the cover did I realize that the lovely bloggers Elsie and Emma wrote A Beautiful Mess Photo Idea Book. While I’m not such a regular reader of their blog, I adore the bright colours and photos whenever I do peruse their posts. In the same vein that I love the colourful pop of their blog, I enjoyed leafing through the book. Sadly, the textual content didn’t do much to elevate it to an indispensable reference book. 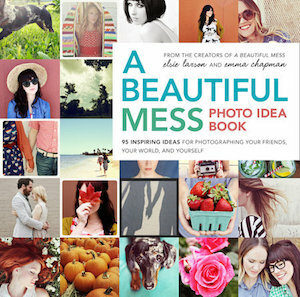 A Beautiful Mess Photo Idea Book serves more as inspirational eye candy if you’re stuck in a rut or are looking to mix up your own photography. Of the 95 ideas that they noted, most were pretty straightforward ones that someone brainstorming for ideas would likely have on their lists anyway: changing backdrops (looking for interesting ones as well as constructing), adjusting depth of field, recreating photos, capturing hobbies, playing around with filters, using props etc. These ideas were mostly general, demonstrating how the authors have applied these ideas rather than offering more in-depth explanations that others can springboard from. There were some interesting ideas to me though: creating a chalkboard backdrop and adding hand colouring to printed black and photos. Even if most ideas weren’t refreshing, I’m sure most readers would still find a couple of ideas that they’ve not tried before. Plus, after flipping through you’d definitely want to play around with your camera because one thing that A Beautiful Mess Photo Idea Book does have going for it is that it’s overflowing with exuberance and life. I love A Beautiful Mess- I’m a huge fan of their blog and photos! I’ve seen this one at our local bookstore and while I would love to read it, I could only do so if I bought a copy. (Crying because of the lack of decent libraries here in the PH.) Hearing your thoughts and how the book isn’t that in-depth, I think the need to read isn’t as great but I’ll still check it out if I found it for real cheap or something. Thanks for sharing your insights on this one!